I think it’s human nature to want to see our bad guys break good. When I think of traditional “good vs. bad” role-reversals, beyond comic books, I always think or professional wrestling and how two of the most popular and profitable good guys in the industry’s history – Stone Cold Steve Austin and The Rock – rose to fame after initially operating as heely, rule-breaking “bad guys.” I think you can’t be a successful villain from a pop culture standpoint unless you have some kind of charisma that forces people to simultaneously despise, yet sympathize with you. That’s why, when the character inevitably does turn “good” for a storyline, people are eager and ready to eat it up. Talking strictly comic books, one of the most notable breaking good moments in my lifetime of reading came with Venom. Originally introduced as a murderous sociopath out for revenge on Peter Parker/Spider-Man, his turn towards the forces of good was both surprising and logical during the Maximum Carnage storyline. Even though I always enjoyed Venom as a foil for Spider-Man, I was equally interested in rooting for the guy to do the right thing during MC. I’m sure there are countless other instances throughout comic book history where the villain has his “good” moment, but Venom is just the one standing out to me at the moment as I’m preparing to organize some thoughts about the second part of Spider Island’s Spider-Girl miniseries. Those who haven’t checked in with the miniseries so far – and I understand why you wouldn’t since Marvel is seemingly over-saturating the market with tie-ins and miniseries related to Spider Island – are nevertheless missing an interesting turn of character from one of my all-time favorite villains in Kingpin. 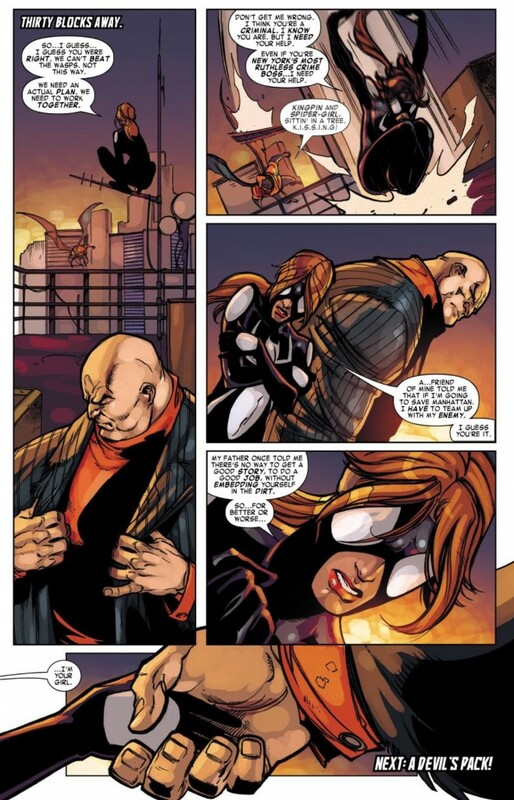 I was shocked to see a spider-powered Wilson Fisk at the end of the first installment of Spider-Girl. It left me giddy trying to imagine the chaos a criminal mastermind with spider-powers could cause. But the fact that creative team, lead most notably by writer Paul Tobin, decided to go “the enemy of my enemy is my friend” approach to this story and have Kingpin and Spider-Girl team up to fight the Society of the Wasp group is ultimately a more satisfying path for me as a reader. 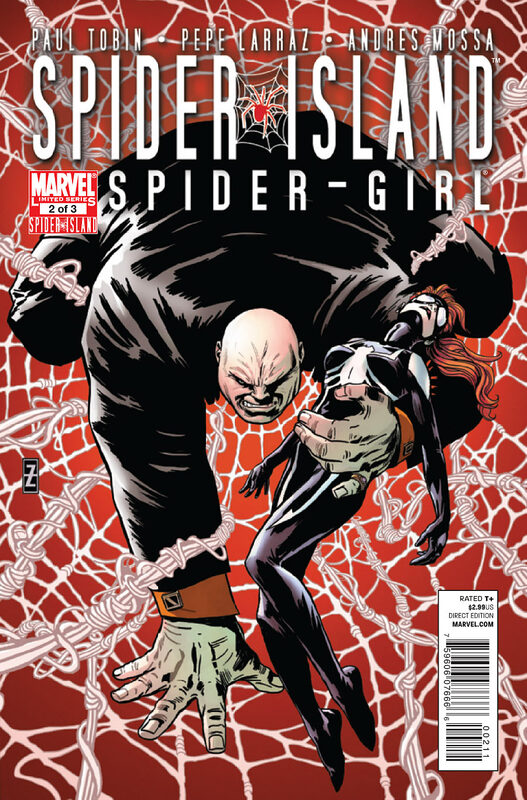 While I fully expect by the end of this series that natural order will be restored and Kingpin will once again be undermining the forces of good rather than helping them, my interest level is more engaged with this unique opportunity to sincerely root for the “bad guy.” While questions could be made about the logic used to bring Kingpin and Spider-Girl together, Kingpin’s justification to fight side-by-side with someone else with spider-powers against a group of creatures that want to eradicate all humans who caught the spider virus makes good, sound sense. As a reader, that’s all I can ask for during a shocking plot development. 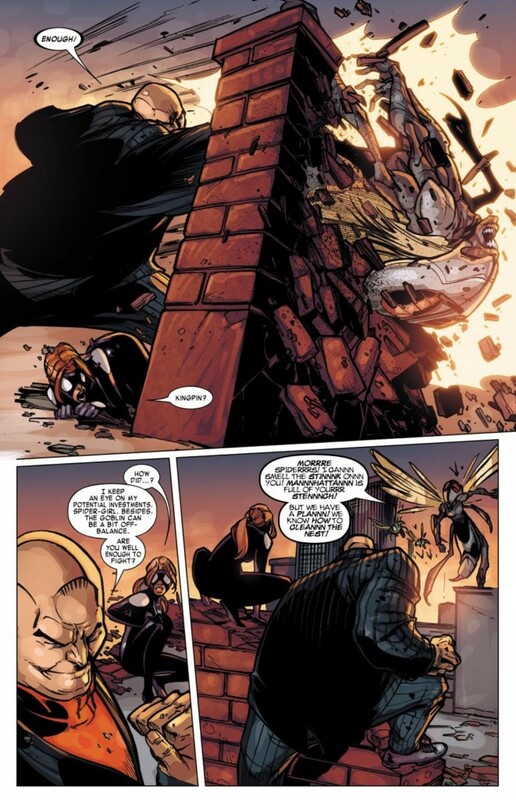 The issue is also another case by Marvel of really working a delicate balance here – a tie-in to a major comic book event that both integrates the story successfully while functioning independently of the flagship Amazing Spider-Man issue. Interestingly enough, I found that Marvel has been more successful in its miniseries thus far like Cloak and Dagger and Spider-Girl rather than its one-shots like The Avengers and I Love New York City. At the risk of repeating myself, these three-part minis are giving me a chance to either get acquainted or reacquainted with a group of characters who have otherwise been in my periphery. 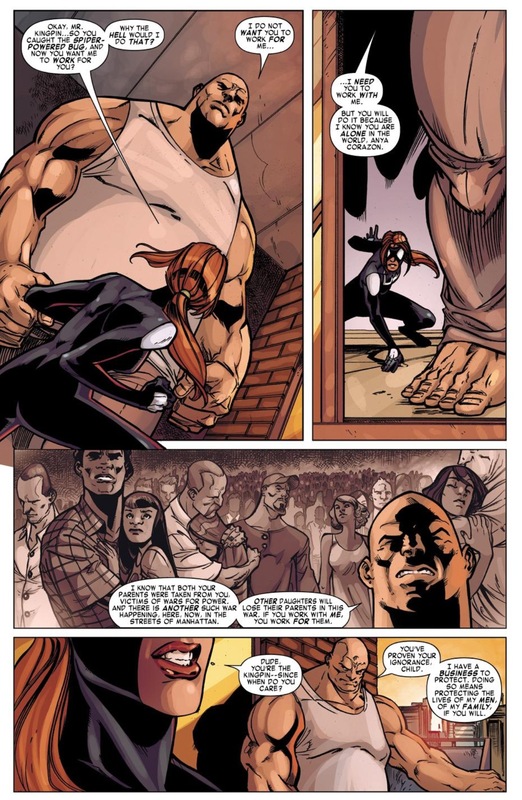 Yet in the bulk of these series, I totally accept why Marvel chose to integrate them into Spider Island. There have been few reaches. And because of Spider Island, I have a miniseries dedicated to a villain who I love and who doesn’t get worked into the main ASM stuff as much as he used to be, where I get to watch this guy take an unexpected character journey. You can’t ask for much more than that in a miniseries – a sensible breaking good moment that may be short-lived, but is entertaining all the same.